Did you know that cholesterol comes from animals? And only from animals? Of course you did, because you're a savvy vegan. For some reason, the average person has a hard time believing this fundamental nutritional fact. Is the average person's skepticism valid? A little. Case #1 is impossible, because the Vegan Chocolate Chip cookie lists only 8g of total fat, and the Vegan Oatmeal Raisin Cookie lists 13g of total fat. Case #2 is unlikely; the corporate nutrition advisors at Peet's Coffee would have to gravely misunderstand the definition of "vegan." Case #3 is likely; the document contains a lot of numbers and data entry is prone to human error. http://www.peets.com/stores/baked_goods.asp and found some errors. We have verified with the owner of the bakery that supplies our Vegan cookies that there is no cholesterol in these cookies. It was an error in our information but it will be corrected as soon as possible. This was just recently brought to our attention so the online information is in the process of being updated. I apologize for any confusion this may have created and hope this information is helpful! Please do not hesitate to give us a call if you have any questions, anyone here is more than happy to assist you, even if you simply have questions about coffee or tea. We are open five days a week: Monday through Friday 6am to 6pm PST. The title of this post should really be "Welcome back!" because I haven't posted for months. But it wouldn't make a lot of sense, because I'd really be welcoming myself back. Self-welcoming probably has some affirmative psychological value, but it's corny. More importantly, it doesn't encourage SEO-friendly blog titles. So I've collected 4 bloggable things in as many months. Let's cover them chronologically. First off, way back in December I made a couple dishes from Isa Moskowitz's newest book, Appetite for Reduction . 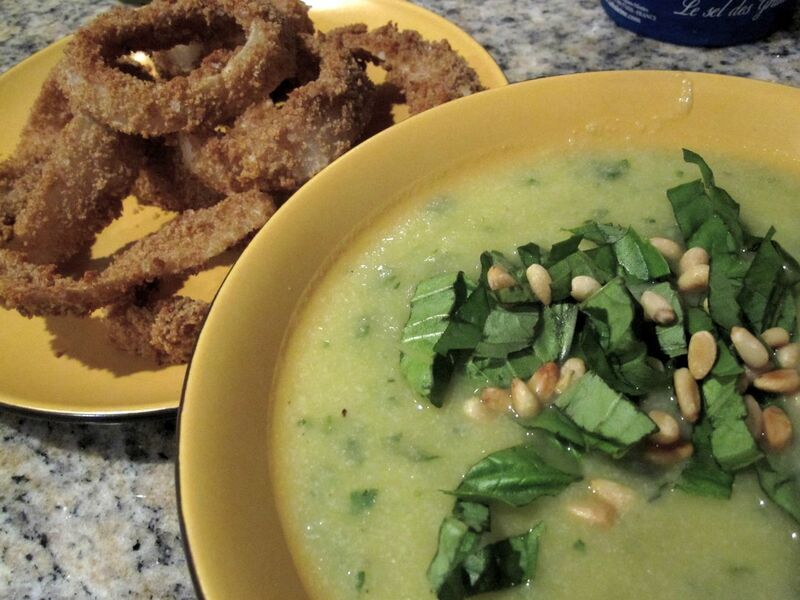 I went for fast and apparently delicious, choosing Cauliflower Pesto Soup with a side of OMG Oven-Baked Onion Rings. The soup came out pretty good; it's mild and soothing, suitable for post-shoveling nourishment, or for nursing an ailing loved one back to health. I'd look for something with more character--and calories--if I wanted to impress a guest. Unless that guest was trying to lose weight, in which case this soup hits the mark--it weighs in at 50 calories per serving. 50. I do not believe that anything could taste better than this without being more caloric. I fucked up the onion rings. I couldn't find any healthy bread crumbs at my local rip-off health food store, so I bought a bag of Ian's Whole Wheat Panko Bread Crumbs. (Isn't "bread crumbs" redundant in that product name?) The problem with this panko is that it doesn't adhere to the onions rings with the batter from this recipe. The crumbs are too large. I was on the verge of throwing the whole mess away, but chose to improvise instead. I replaced the panko with a mixture of flour and salt and coated the rings with cooking spray before throwing them in the oven. I gave about half of the results to my beloved and eternally hungry companion Thisbe, and saved the best for the photo. Now that some time has passed since that crisis, I can appreciate the results more objectively and admit that the onion rings look just fine. They tasted just fine, too. While they're much healthier than their deep-fried counterparts, 220 calories a serving is no small sum; it might be worth it to save up your onion ring desires less frequent, more fried experiences. 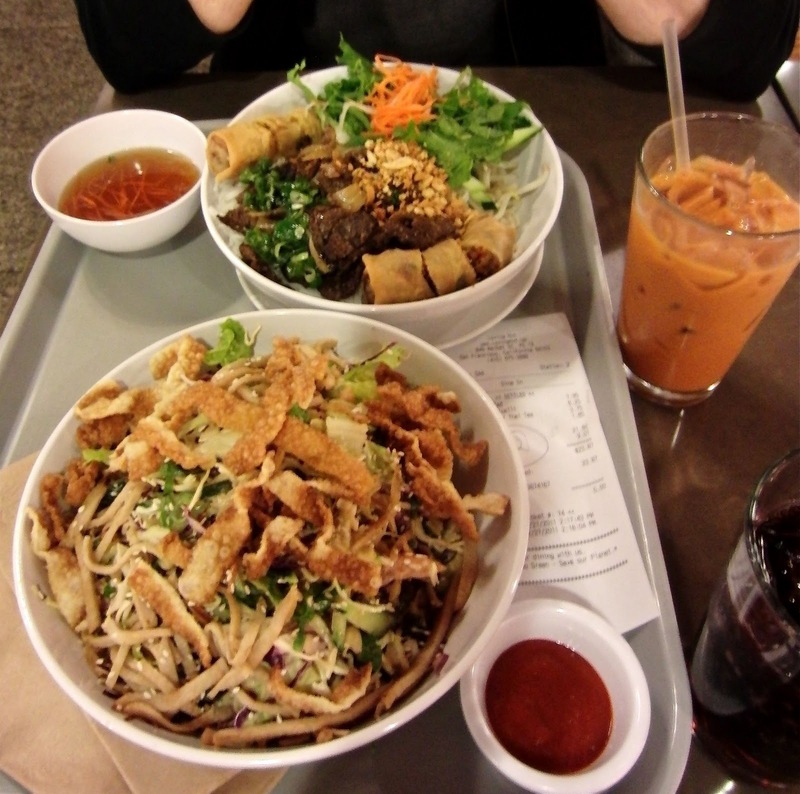 Let's take a break from my amateur cooking stories and appreciate a photo my friend promnesiac took of a recent meal at Loving Hut in San Francisco Centre Mall. I think I've blogged about this place more than any other single topic. Well, it's no mystery why. It's always mildly bizarre, and always heavily delicious. Shown in the foreground is a Rainbow Salad. In the distance, a Garden Vermicelli. To the right, a vegan Thai iced tea. Everywhere, deliciousness. Great. Back to amateur cooking. In fact, back to Appetite for Destruction. By far my favorite dish from the book thus far is the combination of Broiled Blackened Tofu and Jerk Asparagus. My tofu didn't turn out very black, but its coating sure did. I had to slap two wailing smoke detectors off my ceiling like an angry bear slapping wailing smoke detectors off his hibernation cave ceiling. You know, like in the fairy tale. Anyway, I made one significant and accidental modification to the tofu: I added a minced habanero to the coating. It's significant, because it's hot (though not as hot as I expected; I guess burning it burns off its burn). It's accidental because I meant to add it to the jerk sauce. The good news is that it worked, and I would do it again. 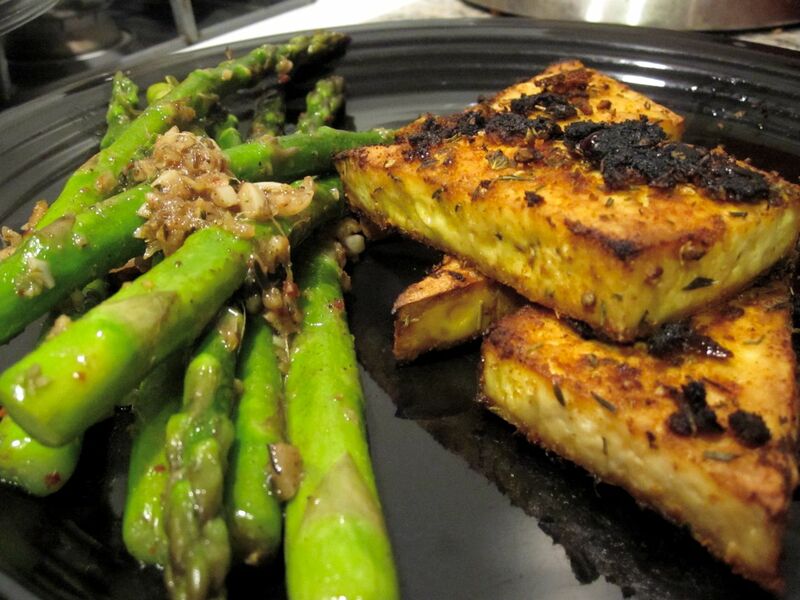 The tofu was very tasty, remarkably so for 100 calories a serving. The asparagus, on the other hand was amazing. It was so, so good. Just look at it! How many calories a serving? 40. That can't be legal, either by human social standards or by universal laws of physics standards. 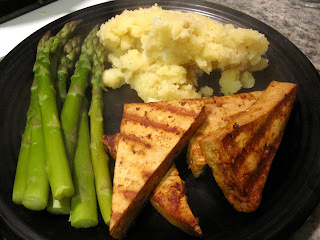 Now let us contrast that delicious, creative dish with my own boring, uninspired what-I-usually-prepare dish here: grilled tofu and steamed asparagus. Edible, sure. Low-calorie, too. But look at the apologetic color of the asparagus. Sauteing it would clearly have been a better way to go. The saving component of this dish is the Caulipots from Appetite For Reduction, weighing in at 169 calories per serving. I've made that side about 5 times already. It's the only sane way to eat large quantities of cauliflower.